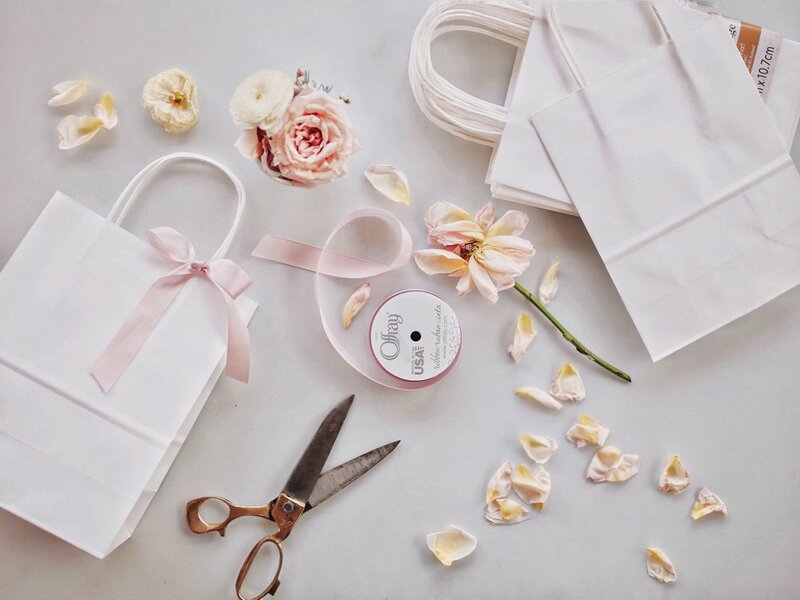 If you’re in the middle of planning a wedding or a bridal shower you’ll know that cute gift bags can come at a hefty price. I am not afraid to admit that I’ve dropped over $30.00 on a grouping of 3 gift bags, that’s $10.00 a bag. Those bags probably cost more than the gift inside of them. I know, jaw dropping. I came across an image on Pinterest and it inspired me to come up with an adorable gift bag with a way better price tag. After searching online and finding tons of options for white bags on amazon, we got these white gift bags from Walmart, they came in a bunch of 13 for just over $6.00 (making each bag under .50 cents a piece) This was by far the best deal we found. To pretty them up a little we also picked out some pink ribbon from Walmart. We went for a more neutral pink so it didn’t look too much like a baby shower. I originally wanted to use some silk ribbon from either Stella and Wolfe or something cheaper from etsy but this ribbon did the trick at it was only $2.00. Stella and Wolfe ribbon is around 30 bucks a spool. So this did the trick. When figuring out how long you want your bow tie it onto the handle before cutting it so you don’t waste any ribbon. I wanted my ribbon to hang down but not too long. Once you’ve got it right give the ribbon a snip on an angle for a nice tidy edge. Untie the bow and cut the as many strips of ribbon that you need at the same size and tie them around the remaining bag handles and voila you have adorable bags for an amazing price. you’re better off buying these in-store at walmart, they’ll be in the craft section, they won’t be in the gift bag section, at least they weren’t at my walmart.